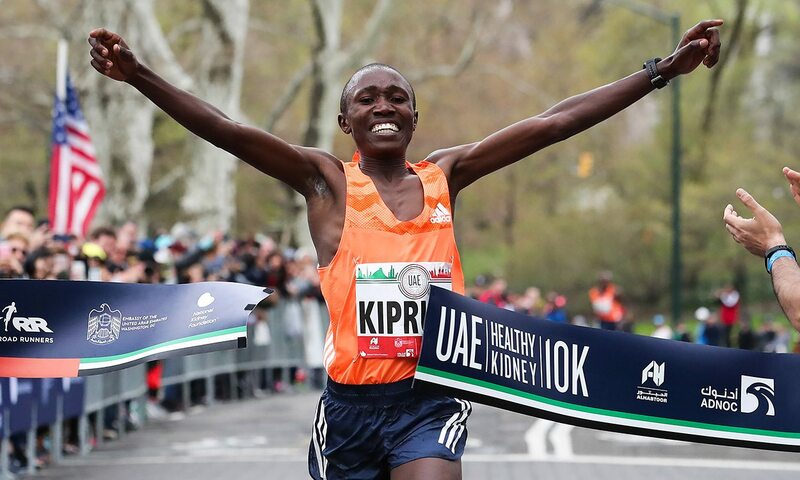 Rhonex Kipruto (pictured above) moved to fifth on the world all-time 10km lists with a world under-20 record of 27:08 to win $40,000. 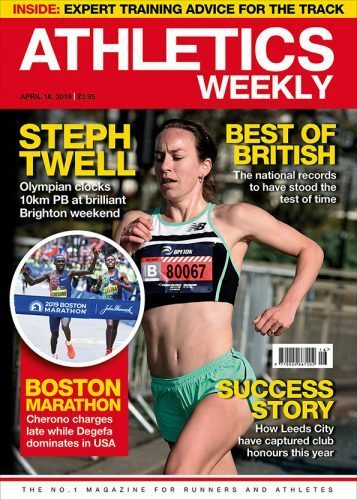 The 18-year-old’s 8km time of 21:45 is a world best and the fastest 10km time ever recorded in the US on a record-eligible course. His fellow Kenyan Mathew Kimeli was second in 27:19 and Ethiopia’s Teshome Mekonen third in a time of 28:10. 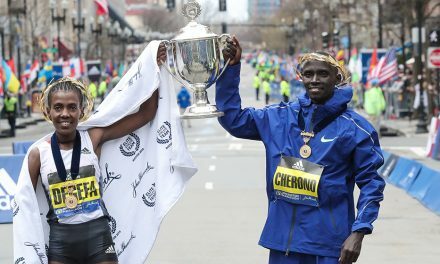 Buze Diriba (32:04) and Aselefech Mergia (32:06) took an Ethiopian one-two in the women’s race ahead of Kenya’s Monicah Ngige (32:15). 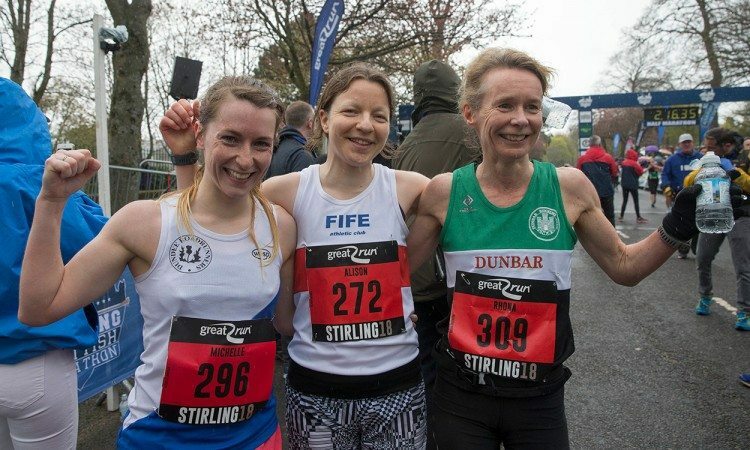 Alison McGill won the women’s race in 3:02:35 from Michelle Mackay with a time of 3:05:01 and Rhona Anderson in 3:09:46 (pictured). Michael Crawley won the half-marathon in 69:33 as Sarah Brown was first woman in 85:33. 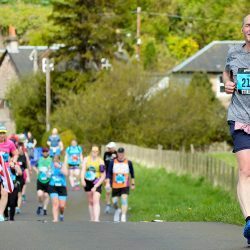 A total of 6000 had signed up to the marathon and half-marathon distances, taking on a picturesque route through several historic locations in Stirlingshire. A day earlier, hundreds of youngsters took part in the growing Thistles Great Stirling Family Run held as part of a family-friendly fun day in Kings Park, where the marathon and half marathon finished on Sunday. 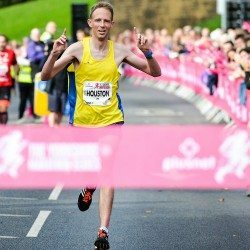 Paul Foster, Great Run Company CEO, said: “The Stirling Scottish Marathon has showcased central Scotland in all its glory this weekend. 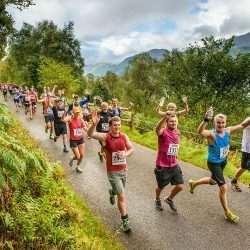 “We’re delighted with how our second event here has turned out with runners being cheered on by thousands of supporters. We’re grateful as ever for the support from Stirling Council, as we look forward to continuing to grow this event. Hannah Cockroft opened her season with times of 17.67 (+1.7) in the T34 100m and 60.59 in the 400m. 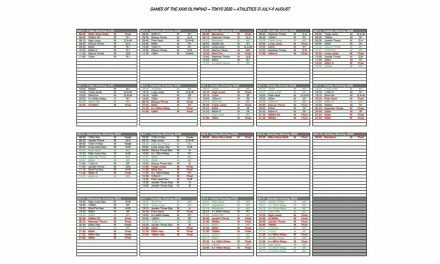 Richard Chiassaro won the T54 400m ahead of Nathan Maguire, 49.89 to 50.49, but Maguire won the 100m, clocking 15.20 (+1.4) to Chiassaro’s 15.63. The USA Red team of Destinee Brown, Aaliyah Brown, Kimberlyn Duncan and Raevyn Rogers clocked a world best 1:35.20 in the sprint medley relay. American teams also won the men’s 4x100m in 38.39 and 4x400m in 3:01.31, plus the women’s 4x400m in 3:26.73. Jamaica won the women’s 4x100m in 43.14. Ryan Crouser won the shot in his season’s debut with a 22.01m throw to defeat world indoor champion Tom Walsh’s 21.82m. Sandi Morris won the women’s pole vault with a 4.88m vault. World record-holder Keni Harrison won the 100m hurdles in a wind-aided 12.37. Sophie Hitchon won the hammer with a throw of 73.22m. Solomon Deksisa led an Ethiopian clean sweep. Deksisa, who won the Mumbai Marathon in January in 2:09:34, clocked 2:06:34 ahead of Tadu Abate (2:06:54) and Ayele Abshero (2:07:19) with former world and Olympic champion Stephen Kiprotich from Uganda fifth in 2:07:57. Bahrain’s Shitaye Eshete won the women’s race in 2:24:51 ahead of Ethiopia’s Birke Debele (2:25:28) and Bahrain’s Mimi Belete (2:26:06). Belarus’ Volha Mazuronak won in in a European-leading mark of 2:25:25 ahead of Fabienne Amrhein, who become the German champion in second in 2:32:35. 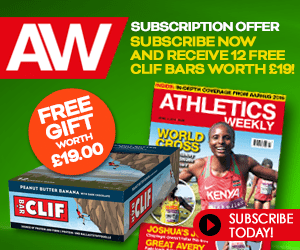 There was a Kenyan one-two in the men’s race with Gilbert Yegon (2:13:55) winning from Richard Mutai (2:14:08) after the lead car made a wrong turning at 8km. Tom Groschel was third in 2:15:20 and won the German title. 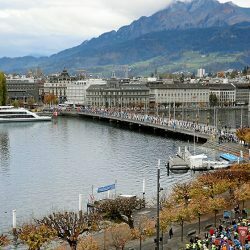 There were wins and personal best performances for James Carpenter (2:33:32) and Natasha Cockram (2:44:58) in the inaugural edition of this marathon. Commonwealth steeplechase sixth-placer Ieuen Thomas (pictured) won the 10km in 29:43, while Rachel Felton won the women’s race in 35:04. 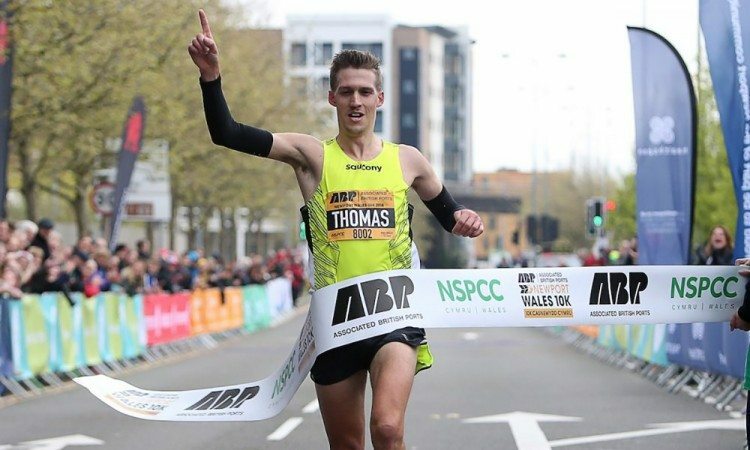 Thomas had a 72-second winning margin over Morgan Davies of Swansea Harriers, who was second in 30:55. Abed Teweldebrhan of Newport Harriers was third in 31:32. 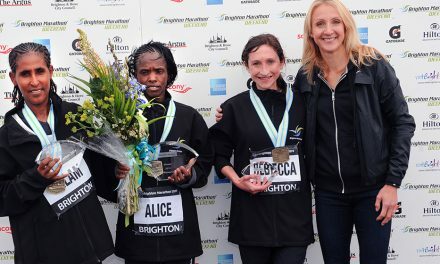 Stevie Stockton claimed the England 5km women’s title, clocking a PB and course record of 15:38 in the mixed race. Emily Hosker Thornhill was second and Kate Holt third. Richard Allen won the men’s title in 14:07, finishing five seconds ahead of Emile Cairess and Jack Martin. 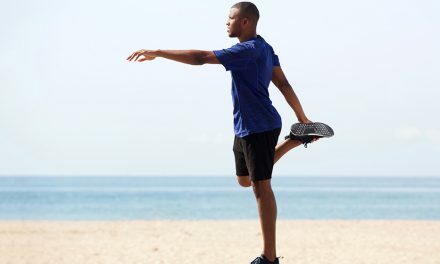 Olympic long jump champion Jeff Henderson won with a world-leading 8.44m. There was a US college record and world lead for Kenyan Michael Saruni with a 1:43.25 800m. Ashley Henderson ran a 10.98 world lead in the women’s 100m. There was also a college record of 19.46m by Maggie Ewen in the women’s shot. In the men’s 100m Isiah Young won in 10.02 with CJ Ujah third in 10.13 ahead of Olympic double sprint medallist Andre De Grasse who was fourth in 10.15 in his first competition for almost a year. Caster Semenya won the 400m in a PB 50.48. She also won the 200m in 22.83. Phil Matthews won the men’s race in 67:59 while Hayley Munn won the women’s event in 78:06 from Amanda Crook’s 78:14. Robert Wood won the men’s race in 69:36. Helen Cozens was first woman in 81:54.